A metal wire spring that functions in a spring mechanism that compresses, extends,rotates, slides, pulls and exerts force when an equal or greater force is applied. 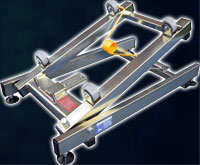 A spring mechanism can exert pressure, rotational force or pulling strength in a variety of ways. For help with mechanical spring design use our spring calculator. The examples below show numerous advantageous ways mechanical springs used in a spring mechanism can help improve your product. They are types of mechanical springs that can be used in valves, suspensions, ball point pens, on shafts, in a round hole or anywhere a pushing or compressing force needs to be applied. Mechanical spring design can be adapted to achieved many different configurations. Read our compression spring design white page for more details. 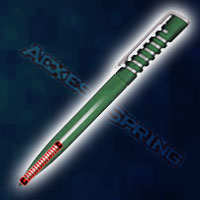 Let Acxess Spring Help in your mechanical spring design to meet your products requirements. They are steel mechanical springs that exert radial forces when rotated. A torsion spring works by placing the torsion spring over a shaft then fastening one leg or one end securely against a plate or a pin so that the other leg or end can rotate and give you rotational force. Torsion springs increase in force the more you rotate them radially. This means that the more degrees you travel or turn the unfastened spring leg the more force you will gain. Torsion springs can be used for lift gates, garage doors, Control levers, spring hinges and many other torsion spring applications. For help on torsion spring design read more. They are wire mechanical springs that can be used in trampolines, pull levers, garage doors, screen doors or anywhere a pulling force needs to be applied. Extension springs have hooks on the ends so one can place them on a shaft, over a pin or through a hole. 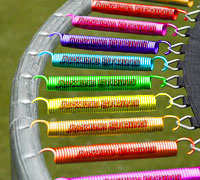 Their are a variety of tension spring hooks available so you can choose your hooks style to fit your specific needs. Extension springs with no hooks can also be made so one can thread a screw or a bolt into the inner diameter of your spring thus fastening the ends of your spring to a bolt. 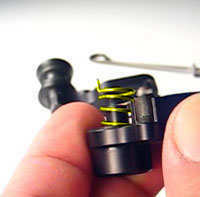 The practice of screwing or threading an extension spring body over a bolt increases the life of the spring by eliminating the possibility of the hooks breaking after repeatedly pulling apart of the spring. To design your extension spring use our extension spring calculator here. They are round mechanical springs that are coil springs made into a ring or a continuous round circle. Garter springs are used in rubber seals, oils seals and spring belts that require slip resistant belting. These continuous round springs give radial outward force meaning when you expand the round circular spring, force will generate and the garter spring will want to contract back to its original diameter. This is why garter springs are great for use in oils seals or urethane seals. Garter springs are belts that are used to help keep pressure on a seal. These endless belts can also be used as non slip elastic belts to rotate a pulley in slippery environments where oil, goo or syrup is present. They can be made continuous or connectable and in either spring steel like music wire or in 302 stainless steel or in 17-7 stainless steel for high temperature connectable spring belts. These slip resistant belts are offered in a variety of end configurations like connector ends, tapered screw in ends and looped ends to join the circular spring together. For more help on garter spring or oil seal spring design go to our garter springs technical information page. 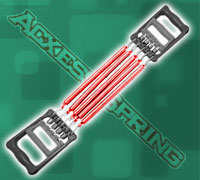 Let Acxess Spring help you with sharing our 30 years of mechanical spring making experience. Visit the Instant Spring Quote to get pricing on custom mechanical springs.